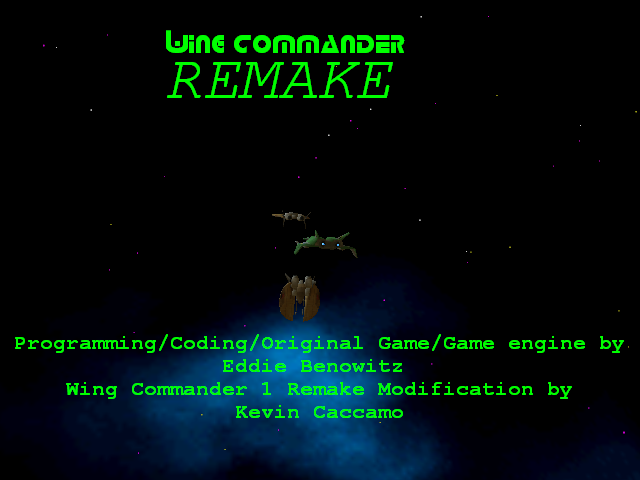 The Wing Commander 1 Remake project is a modification for Flight Commander made by Kevin Caccamo. 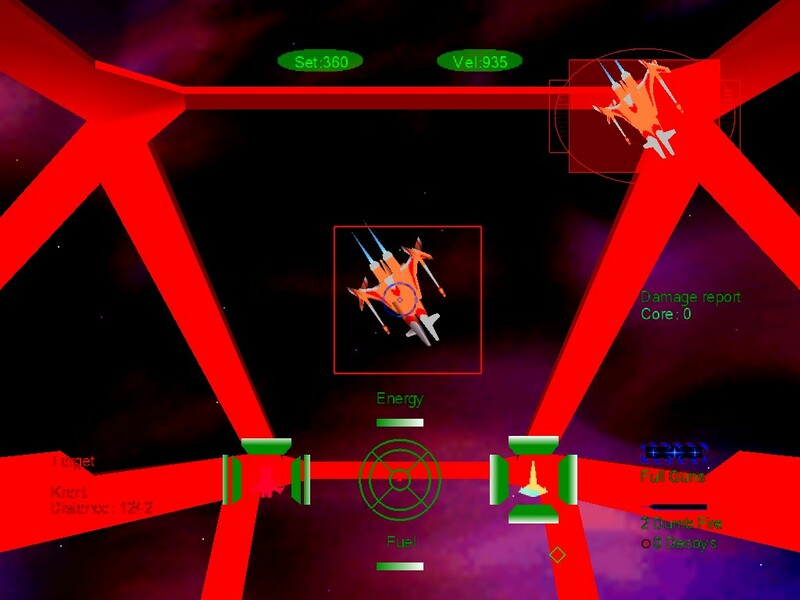 Flight Commander is a game which was programmed and coded by Eddie Benowitz. This website gives you all you need to know about the wc1 remake project. All screenshots are taken by the ultima online screenshot utility. Ships have been converted from Wing Commander: Unknown Enemy, and the X-Wing Alliance TC. The project used a variety of tools available from the flight commander website (flightcommander.solsector.net) and thomas bruckner's website (tbruckner.esmartweb.com). Look on the flight commander website for more details on how to play flight commander. This site uses Dreamweaver MX 2004 to make it more compatible with linux systems. Apparently, microsoft has phased out a feature of Frontpage that we once used. Whoa! It's 2008 already? Time flies fast, doesn't it?! Anyways, WC1 Remake has won the FC Mod of the year 2007 award. A big thanks to all who support this mod, and Happy new year! Finally, I have minefields in WC1 Remake! Eddie Benowitz offered some assistance with my script function and I was able to get a lua script-created minefield working! Apparently, I had to make the mission completely script controlled before it worked. Apparently, Spertallica downloaded the WC1 Remake and found that I had left out some files which the game needed. I made a small patch for him. You'll need to download it and apply it if you have downloaded WC1 Remake Standalone release on August 10. Thank you. Happy birthday, Wing Commander CIC! I celebrate your ninth birthday by releasing my final version of the Standalone WC1 Remake. Your party was pretty awesome! The amount of updates you had on that day was truly astonishing! The Wing Commander Arena contest entries were pretty amazing too, especially the Wing Commander: Secret ops graphics modifications featuring new nebulas and the hi-res HUD stuff, too. Most of all, the Wing Commander Wiki (WCPedia) is up! You guys are a truly astonishing community! I love being a part of WC CIC and I probably could not find anything better to do without you guys. I will (hopefully) release it August 10, 2007. And if you're wondering if anything else happened, the downloads section has been revamped, and some new items have been added! Enjoy. I believe it's about time we had an update! I have been working on the WC1 Remake again and I have started creating mission briefings. The raptor also got updated! I was quite dissatisfied with it's large size, so I reconverted it. Hopefully, it's size is more comparable to the original Wing Commander Raptor. Speaking of updates, I added a new section to the progress page: Briefings. I have released the WC1 Remake again, but this release has the replaced music (Bar and simulator) and the new crosshairs. Enjoy! I have made a lot of updates so far on Wing Commander 1 Remake. I have started to add features like Kilrathi minefields. The real news is that Wing Commander 1 Remake has a new crosshair from WC1, but it looks even better than the original! Also look out for a standalone release of WC1 Remake, COMING SOON!! The new release of the Wing Commander 1 Remake project is now out and the downloads page has been updated. I have conducted a "test run" of Wing Commander 1 Remake with another copy of Flight Commander. I added in what I forgot, and hopefully, it will work alright. I am extremely sorry about neglecting a new release of WC1 Remake. I do have 3A, 3B, and 3C done as of now, but there are still some HUGE bugs to work out in the scripts and missions, so I will be busy with that. For example, at the end of mission wc1s3bm3, when you go back to the Tiger's claw, the mission checks to see if you have won or lost. Objective_setState is called and the program says "Objective_setState is a nil value." I DO NOT LIKE NIL AT ALL! Wing Commander 1 Remake has a Dorkir!! Thanks to me and Wings3d, or this would never have been possible. The texture coordinates were modified with Milkshape 3D and the texture was created by me and "texturized" in Microsoft photo editor. The progress page has been updated. At last, but not least, all recent news has been moved to the top of the page while the earlier news is at the bottom. It's about time I put the newer news at the top of the page. Wow. Anyways, I got rid of the old startup screen for a nice new one that looks a little bit more like the Wing Commander intro movie. From now on, I will want to make site updates, like putting the more recent news at the top of the page so you won't have to scroll down (annoying?) and so that the site is more realistic. I am sorry about the lack of site updates. I got a computer upgrade at Christmas time. When I had my computer upgraded, the operating system was changed to Windows XP. I also got a new hard drive which held more items. I did not install Macromedia stuff like Dreamweaver and Fireworks until just recently. Anyways, I have started to play around with mission briefings. I position the objects such as the player, navpoints, etc. in the FC Mission Editor and I do the rest from scratch with a normal text editor. Just so you know, it has not been going very well. I took a screenshot of it and posted it on the screenshots page. Also, I made various site updates. I released a totally new version, including all files (By Eddie's Request) And a few debugged missions along with a note to mission programmers who fail so often at getting the right results for ship-related objectives. Added a link to the downloads page to the XnView website where you can get NConvert. I released the WC1 Remake Gold Edition. It has everything included as promised, except Episode 3, but that is a way long gone promise. Instead, I made the losing path for Episode 2. I cannot even make Episode 3 because I have some voice acting that needs to be done by some fans for Angel's voice. I made an update to the WC:SO Grendel with a fixed hardpoint for the tachyon guns. Much more like Starlancer, but what a blast from the past it is. Today, an unusual bus cancellation was issued because of freezing rain. Because of that, I updated the screenshots page with a good view of the new WC1 Remake menus. I also updated the Wing Commander: Secret Ops grendel download for anyone who wants a grendel that's NOT transparent. I may have a bit easier time converting meshes to WC: Secret Ops thanks to an upgrade to Biturn and some REALLY BIG help from Macromedia Fireworks MX 2004 and NCONVERT.EXE. I am actually considering releasing NCONVERT.EXE with the WC1 Remake Gold Edition. See the forum thread for details. I'm sorry that it has been a long time since I got to work on this project, but I have been busy on other things. I had to do at least two research projects at the same time. I changed the text above the FC Mod of the Year award so it is more age-appropriate for me and any other people who view this site. Updated the site to a ruthsarian layout called Skidoo. There is much to be done in so little time. Signed up for an agreement with Iceblade to make a historical mission for Ranger's Glory. I also need to make a losing path for the second episode and make scripts for the losing path too. I will call it "WC1 Remake Gold Edition"
Hey guys! We got a site update for you! This project has won the FC Mod of the year voting contest. I am putting a new section of the site up showing you some behind-the-scenes points about the mod. I am wishing I could release the improved script and mission pack soon. Started working on a script and improved mission pack. I had to start working on this project soon, because lately, no progress has been made. I hope I can upgrade this page with a Ruthsarian Stylesheet for a cool layout. Sorry for no update in a while. I updated the WC1 Remake Demo ZIP File so now you have the full enyo system campaign. This was a long time ago, but I did a test run of WC1 Remake in a Flight Commander Version 1.3. I recommend you re-download your demo copies of WC1 Remake. Added a download to the downloads page. It's the Starlancer Grendel for Flight Commander! You can have your fun with that while I work on Episode 3. It has not even started yet. Also updated the screenshots with another screenshot. I updated the screenshots with the new krant texture by photo editor. I hope it looks good like it should. Why another Silly update? There's another screenshot headed your way and instead of the "here" pointing to the ZIP file, it now points to the instructions and the screenshot is a clearer view of the nitty-gritty Krant texture (LOL. )Many Many Hours Later...Retextured the Jalthi and reworked it. Please do not give me any rough comments. A picture can be found in the screenshots. Also registered at the CIC. You can contact me at the WC1 Remake thread. Following the link will take you to the thread. I need to get started on episode 3, since I have the ships. Really overdue on updating the progress page. Sorry. Played around with Microsoft Photo editor and came up with a good idea. I tried a few effects, but many to no avail. The last effect I used was the texturizer with a Sandstone setting with a top light position, 50% Scale (Minimum), and 5 for the Relief value. It still looked great! Updating your WC1 Remake Demo ZIP Now... Also put 2 new screenies up. Gotta check them out. Much Later...Did the same above with photo editor with the Krant texture, but I made the light go diagonal this time so it looks more generic. Uploaded an update. It looks much much better now that photo editor has done it. Continued retexturing the krant. At least the new textures did not look as bad as I had suspected they would look. I textured another model and it turned out looking great. Oddly enough, I do not have to go to school today. Eder, please send me an e-mail telling me about your opinion on retexturing it. I am retexturing the model based on how you textured it. If there is red, I paint red over it, not that I use the exact same color as you did. But I use the colours that are availible. I retextured the Krant. Take a look at it in the screenshots. It shows a picture of the krant's new texture in gameplay. I tried to revise the texture as well as I could to make sure none of those pixels looked like they belonged to Eder. I am also trying to get permission to use the Standoff Jalthi mesh. I also fixed the link to the Links section of the site. Now I need to get a new version of WC1 Remake online ASAP. Wow! I got to do a lot on WC1 Remake today. Redid the Startup screen and a bunch of other things. Episode 2 was released as a result of working. I probably need some action and some rest. Upgraded to flight commander 1.2 (no longer alpha.) I have to retexture the models I "stole" from standoff so that it does not look like standoff. It's going to be a pretty poor job, indeed. Added a links section so you can see other Wing Commander sites and what they have in stock for you. It's so close to halloween. Well, at least I got the comms for Paladin. Gonna need to play the missions for extra data about CAP 1, CAP 2, etc. Updated the progress page with my updates and my latest thinking. I am sure I am getting the hang of Dreamweaver by now. I wish so badly I had the comms for the second episode. It's hard work, but Episode 2 should start soon. I updated the zip file with new cockpit textures a few days ago. I wish to start working on system 2 which is McAuliffe and release it once I am finished. McAuliffe files will include a Ralari. Updated the credits, progress page and downloads and reworked the download of the demo. I sort of re-released the demo so that you could have all the fabulous updates I have put into this package. Made a few updates to the site through dreamweaver. As you can see, the dates are now green, so you can distinguish them easier. I hope the site gets published soon. I imported the drayman using 3DWin5 and did several modifications. I also simulated my modifications with MS3D. The changes appeared in MS3D almost as if I did the changes in milkshape itself! I upgraded this site to Dreamweaver MX 2004. Second Week of school. Lots of progress that I need to share.First of all, I downloaded cyberion's drayman and converted it. No luck. I am not going to use it. Thanks anyway! I could use it in the futureDownloaded a model of the hornet fighter and made it into the High detail hornet optional update. I give credit to Howard Day and Towlyn at WC MDF for the hornet. This was not easy. I had to rotate it, move it, and scale it down. I did this with 3Dwin5 that comes with Rheingold 3d. I also simulate my actions with Milkshape 3D before I modify anything with 3Dwin5. High detail hornet is just a new mesh with a new texture that looks better. The guns are now long. Take a look at the screenshots to see for yourself. SCHOOL IS ONLY TWO DAYS AWAY! YIKES! But wing commander 1 remake mod is released! Yes! go have some fun! The school year is getting closer and closer. I only have a few more things to do.Fixed the Tiger's Claw so you can land. It's really become a Capship. I might need to add LR lasers for the kilrathi so they can damage the Tiger's Claw.I made the Salthi Weaker. It is not fair that it is fairly maneuverable and well-shielded. So I simply downgraded the shields. Started working on a preview for the future of Wc1 Remake. Also have to remove the guest book because I might get spam. Instead, You will need to e-mail your comments to me. I will try and get the mission 2 briefing fiction today. Imported The Rapier with fixed hardpoints. I am also going to need to import the engine and thruster hardpoints. Well, I am 13 and I have decided to make an appearance. It seems that Eddie Benowitz has been up to something... I found a ship pack that includes ships from Wc1, Wc2, Wc3, Wc4 and Wc: Armada. I hope to use some of these ships in the project, as it will be a great step forward in the future. BTW, Today is my birthday! A bit of small updates to the simulator. Added Simulator Mission Descriptions, Renamed Simulator Missions. I'm planning to add more ace ships to the Remake. Started the fiction and I am done with the first fiction xml. I will need to include briefings in the fiction xml. They are really hard to do. Haha! We have not seen an update for a little while. Added a 2D image and reworked the ships. Now they don't run away, but they are a little tougher. The kilrathi "ace ships" now have boosted shields. Also upgraded to Flight Commander 1.2 and changed the refueler mesh to a rapier mesh and the devil ray mesh to a gratha mesh for eject pickup scenes. All cockpits have a new HUD. I hope you enjoy it as much as I do. Reworked the kilrathi ships and added 2d images for some ships. I do not understand why they are always running away from you. Reworked the confed ships' armor, shields and hitpoints to be more like WC1. Also reworked the three energy weapons based on the data from Wing Commander CIC. Hopefully, I can rework the kilrathi ships soon. Sorry about the infinite power generator and the infinite afterburner fuel, but there is no data about that in WC CIC. Web Site by Kevin Caccamo. Layout by Ruthsarian Layouts. Project Leader: Kevin Caccamo. No assistants helped with this Flight Commander mod project. No people or animals were hurt during the production of this modpack. Piczo.com is a site owned by Funtigo Corporation.